Apparently, my sister's friend has a 3DS aswell and she wanted the game aswell. One of the reasons I've held off cancelling the pre order and going for the download version. Yup I chose this as my free game also, will need to get a bigger SD card though. I was gonna do the same, but I picked Amazon. I can't decide whether to get this or not, I have a horrible feeling, i'll find it so bland. Never played an Animal Crossing game before, SPL? They're bursting with personality, though after much (much) play, the repetiton can hit you. I was playing Animal Crossing: Wild World for years before I started to tire of it, though. Having much more to do this time around, this could turn out to be the best outing yet. The only reason I'm not snapping this up is the thought of interacting with the same personality types again. I played Wild World a bit, but don't remember it so well, I just remember thinking it had no real purpose at the time? I haven't touched AC since the DS outing, so I'm all up for this. I've got it lined up as my freebie. I hope Nintendo take in to account all these people getting it for free when they look at the sales. Chris' feature is actually making me want to buy this. 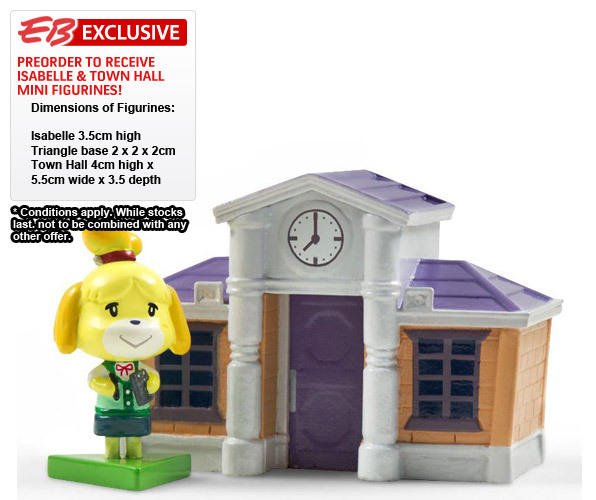 I'm thinking about downloading this as well as the pshyical copy as I want Lili and the town hall but I also feel that this is one that I may get over but will still check in on the town if I get bored. AC:NF is the main reason I bought a 3DS and after finding out it's only 5,000 blocks, I'll be downloading it. Nice! But where did you hear this? I read it on several US blogs since its release. Can't freakin' wait for this, now. I'm even buying the limited edition console bundle. Never ventured into animal crossing, but I am *awfully* tempted by this, I want to enslave things and make them do twisted things to eachother GWAHAHAHAHAHA!!! ahem, as I was saying I'm really tempted by this, it's also available on the day my exams end so bonus huzzah! I've been playing the Animal Crossing game on Nintendo Land all night and it's getting me even more excited for this, even if the actual game has nothing on it like that. It actually has a fruit collecting game in it, on the new multiplayer island. Excellent, hoping those minigames have some endurance to them, the only one I've seen so far is the Whack-a-Resetti one which doesn't seem great. A "game" component is something I've been hoping for in AC for ages. Here's hoping it can deliver. Off topic, but is there a way to play that Animal Crossing game in Nintendo Land as single player? I'd like to play with with mates, but they're all idiots and think the Wii U is a toy. Back on topic...yeah, can't wait for this. I've still got that Zavvi £130 console order as processing, but even if I don't get that I'll still find a way to be playing AC ASAP. Me too, my Animal Crossing wishlist always includes something like mini games so hopefully its not just limited to the mini game island, even something as simple as a mini football field to kick the balls would be nice, with any luck multiplayer can be more than a novelty of just looking around town. Don't think you can play Sweet Day on your own, would probably take away the fun anyway, part of my enjoyment from it is catching the human players who attempt to taunt me. You can play it against CPUs, surely?